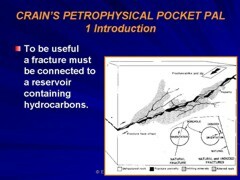 Publication History: This article is based on "Crain's Analyzing Fractured Reservoirs" by E. R. (Ross) Crain, P.Eng., first published in 2004, and updated annually until 2016. This webpage version is the copyrighted intellectual property of the author. The use of open hole logs to identify fractures is a common analytical procedure. It is qualitative at best but there can be semi-quantitative fracture intensity indicators, based on the frequency of occurrence of particular artifacts on the log curves. This Section describes how to identify those signatures. Most well logs respond in some way to the presence of fractures. Each major log type is discussed in the following Sections with respect to its fracture response. Not all logs detect fractures in all situations, and very few see all fractures present in the logged interval. Bear in mind that other borehole and formation responses will be superimposed on each log. Moreover, it is not normal to analyze a single log in isolation, but to review all log curves together to synthesize the best, most coherent, result. Because we are stuck with the existing logs in the well files, this Section covers the assessment of fractures from all these commonly available logs, even though image logs are usually the preferred choice when available. Example of a 4-arn dipmeter log displayed as a Fracture Identification Log (FIL) - dark shading indicates resistivity differences between adjacent pads, probably caused by fractures or borehole breakout. Amethod, applicable to both old and new logs, is to look for cross over of the shallow and deep resistivity. If mud resistivity is less than the formation resistivity, as is true in many cases, then the shallow resistivity curve will cross over the deep resistivity in a fractured interval and read lower resistivity, due to invasion of the fractures. Normally the shallow curve reads higher than the deep, except in salt mud systems. The shallow curve may also appear noisy or spiky. Remember that the deep laterologs are averaging 3 or more vertical feet of rock and that the shallow sees about 1.5 feet, so the differences between the two logs is subdued by this. In thinly laminated shaly sands, the cross over is probably due to shale, not fractures. Check the sample descriptions. For improved resolution, an even shallower focused measurement can be made with a proximity, microlaterolog, or micro spherically focused log, and compared with the deep resistivity log. All are pad type instruments and survey a smaller portion of the borehole, but all have been successfully used to aid fracture detection. Pad type devices do not see the entire borehole, so only a few of the fractures are logged. However, if the borehole is oval because of fractures, most of them will be seen because they are located on the long axis of the hole, where the pad rides. The sharp conductivity anomalies may, at first be confused with a loss of pad contact. Check to see that the tool is reading higher than mud resistivity. ◄ Induction log example showing low resistivity spikes on all three resistivity curves, suggesting the presence of fractures. This is the same well as the core listing given earlier, which also indicated numerous vertical fractures. While the various eras of laterolog tools are helpful in locating fractures in many situations, the induction log may also do the job in medium resistivity environments. Here the shallow resistivity curve may cross over the deep resistivity, dropping to lower resistivity values. Since the deeper curves see a larger volume of rock, they may be less affected by a conductive fracture. If one or more of the deeper induction resistivity curves also spikes to lower resistivity, we can assume that the fracture is relatively deep and therefore significant. It would not be possible to determine whether the fracture is natural or induced by stress relief, but the deeper fractures are often presumed to be natural. 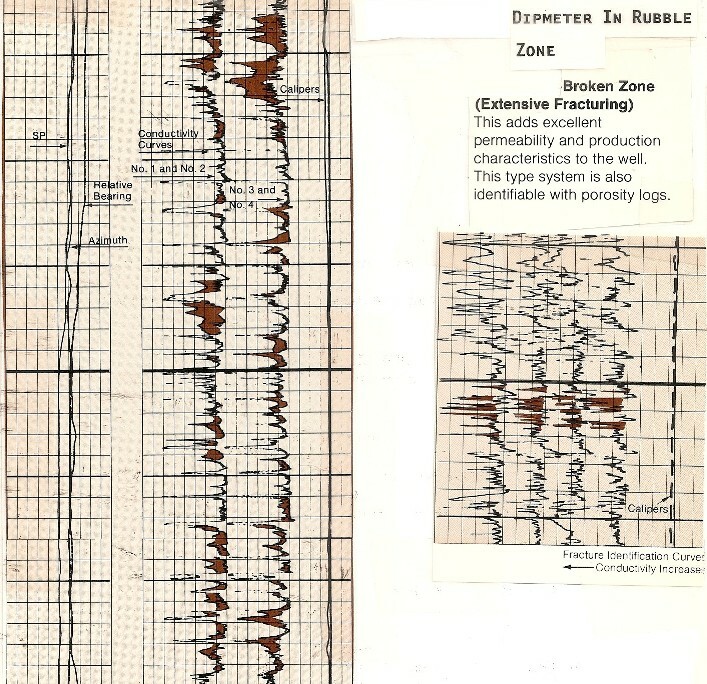 Example of LWD logs in a horizontal well showing heavily fractured interval on all three resisivity curves. Shallow resistivity is much less than the deep resistivity, but there are numerous intervals where the deep curve is also influenced by the water invading the fractures. Density, neutron, PE, and GR are unaffected by the fractures in this well, but the LWD caliper (shaded red in Track 1) shows the erosion and breakouts. The spontaneous potential normally does not develop well in carbonate rocks, due to high resistivity and the long distance to a nearby shale. However, some SP excursion is usually seen opposite very porous or permeable carbonate zones, or opposite lower porosity fractured zones. Fracture detection by the SP is possible in a low porosity or low permeability bed if fracturing has occurred and if the fractures contain a formation water of a different salinity than that in the borehole. Development of an SP is not a direct measurement of porosity or permeability. The SP is a voltage generated by electrochemical reactions between the mud filtrate, formation water, and a nearby impermeable shale barrier. No fluid movement takes place. In addition, a streaming potential can be generated when mud filtrate passes through the mudcake. It is primarily dependent upon mud resistivity and differential pressure. As differential pressure increases, streaming potential increases for a constant mud resistivity. Either the normal SP or the streaming potential can be indicators of permeability and fractures. A streaming potential only exists while fluid is flowing and is not normally seen in a stable wellbore. An example is shown on the left. Depths are in meters and grid lines are two meters apart. The fracture zone below 75 meters is indicated by the shallow resistivity reading significantly lower than the deep. Over the same interval a small SP development is superimposed on a straight line SP with a slight drift to the left. When evaluating SP responses for fractures, remember that the higher the oil saturation (lower water saturation), the more the SP will be depressed. Very small excursions of the log curve may be meaningful. ◄ Minor SP development in fractured zone; spikes to the right suggest a streaming potential, which in turn suggests a flow of mud filtrate into the reservoir, probably through fractures. The SP deflections to the right at 76, 84, and 132 meters may be caused by a streaming potential due to mud filtrate flow into the formation at these depths. This is not certain. Usually streaming potentials are larger and cover longer intervals. These anomalies may be caused by telluric currents, northern lights, rig power bumps, or nearby welding. Another SP method is to compare the character of the SP to that of a gamma ray log over the zone. If the SP develops in a zone which shows relatively high radioactivity on the gamma ray, this could be an indication of a permeable fractured zone in which uranium salts have been precipitated. Many factors influence the SP and it is difficult to identify fractures directly using this method alone, but often it aids in confirming the possibility of a fractured zone. Care must be taken not to interpret random variations or drift in the SP baseline as evidence of permeability. Having detected the fractures, it is useful to count the footage, or meters, of the fractured interval. In the example above, the zone from 75 meters to the bottom of the log, or about 95 meters, is fractured. About 16 meters of this shows little resistivity crossover and little SP deflection, giving a net fractured interval of 79 meters. In competent formations, the borehole will often become oblong when it intersects a fracture. This looks like a hole washout on a two or three arm caliper, but a 4 or 6 arm caliper will show the oblong shape. The long axis of the hole is usually parallel to the strike of folds or faults. This method is best when a sensitive caliper with sharp wall contacts is used. Calipers recorded with most surveys are not very sensitive and serve purposes other than measuring the hole size. Their design does not allow for detection of small abrupt changes. Examples are the three arm bow spring type calipers recorded with sonic and density log which provide centralization as well as hole size measurements. The caliper logs which are most helpful are recorded with the dipmeter, microlog, and modern dual axis calipers on density neutron logs. Special purpose, very sensitive, calipers are available from most service companies. The caliper recorded with the microlog is designed to float on top of the mudcake. It will respond and measure the thickness of the mudcake, instead of measuring borehole rugosity. The presence of mudcake should be more conclusive of permeability and possible fracturing than rugosity alone. Dipmeter pads are pressured to cut through mudcake and usually measure the rough hole if it is present. Other dipmeter curves are also used to identify fractures. Mud rings sometimes form even in front of impermeable zones. Therefore, mudcake indicators of permeability must be confirmed with another log if possible. Rough, large, or irregular borehole in otherwise competent rock usually indicates fractures. Mudcake opposite very low porosity usually indicates fractures. Hole caving due to stress release is very common, but open fractures are not always present. Not all washouts indicate fractures; shale, salt, and unconsolidated sands often erode, but their presence can usually be distinguished by other log characteristics. A good example is shown above. Zone A has a round hole, roughly in gauge, indicated by the four arm caliper, and the dipmeter curves show no fractures. Zones B and C show significant hole elongation on the caliper. Fractures are inferred from this and confirmed by the dipmeter curves. Fracture orientation is roughly NE - SW. This information would help determine well spacing; offset wells to the NW or SE would have to be closer than those in line with the fracture orientation. Remember that a two arm caliper would probably see the long diameter. The enlarged hole is a clue for fractures if the other log curves indicate competent rock. A three arm caliper would average the two diameters, and the hole enlargement may not be as obvious. Most modern density neutron logs display a dual axis caliper, and these curves should be checked carefully for evidence of borehole breakouts. Zone E again shows a round hole, this time oversize, indicating a washout in un-fractured rock. This is probably a shale zone, which would easily be confirmed by a gamma ray or SP log. Shales can erode to an oblong hole, especially in deviated holes or in folded or faulted areas. Micro resistivity logs, such as microlog and micro SFL, indicate fractures by showing low resistivity spikes opposite open fractures, and high resistivity spikes opposite healed fractures and tight or highly cemented layers. In older wells, the microlog, caliper, and an ES may be the only logs available for use in fracture detection, and for porosity and permeability for that matter. The microlog is one of the most conclusive indications of permeability. When the dotted curve (2 inch micro normal) reads higher than the solid curve (1 inch micro inverse), there is some permeability. This effect is called “positive separation”. The caliper curve accompanying the microlog resistivity measurements is also available for mudcake location and thickness determinations. Mudcake is another indication of permeability. On the microlog shown above, there are three porous and permeable layers with positive separation and mudcake, one near the top and one near the bottom of the log section, and another just below the 7300 foot grid line. The lower layer has a single sharp, low resistivity, spike. This is a fracture or a thin conductive shale streak. 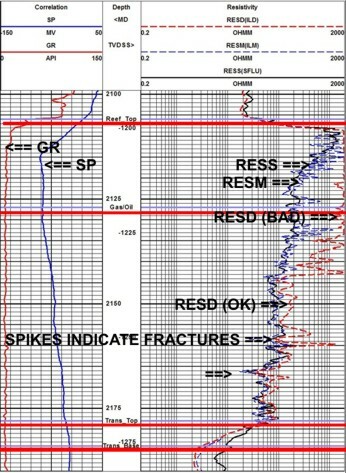 The balance of the logged interval is impermeable and probably shale, which could be confirmed by the SP or GR logs. A newer microlog run in combination with a proximity log is also shown, above right. The permeable zone contains three distinct fractures with several more tiny conductive spikes that could indicate fractures. Only one is seen by the proximity log. If the micro resistivity curves are smooth, permeability is due to porosity; if low resistivity spikes are present, fractures are indicated. The microlog is a very reliable fracture indicator, but like all single pad devices, it only sees a few of the fractures. If the zone is known to be a carbonate or tight sand, and the hole size is larger than bit size, an elongated hole and probable fractures are indicated. High resolution dipmeters with 4, 6, or 8 micro-conductivity log curves, 2 or 3 opposed calipers, plus directional and orientation data can indicate fractures by visual observation of log curve characteristics and from individual dip magnitude and direction calculations. Hole enlargement in a preferential direction discussed in the previous Section, usually caused by fractures, is easily displayed from the multi-arm caliper data, as illustrated below. 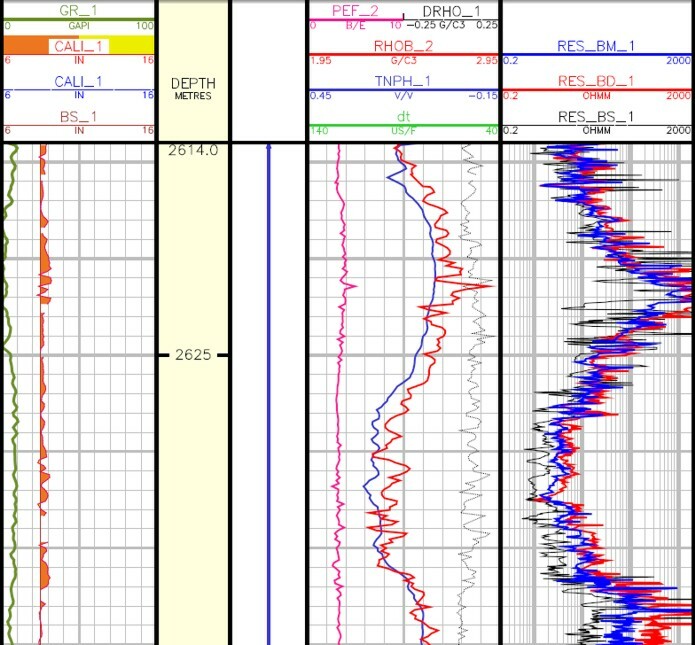 Each dipmeter pad provides a recording of changes in resistivity which occur along the borehole, usually related to porosity variations, bedding planes, or fractures. One pad is selected as reference and its position relative to north is continually recorded. The other pads are numbered clockwise looking from the top down. This determines the orientation of all the pads. The log is analyzed in a similar fashion to a micro resistivity log. However, four, six, or eight pads and better focusing make the dipmeter a popular choice in modern wells, because it is more sensitive and covers more of the borehole wall. The more elaborate micro-scanner log has superceded the dipmeter log in many areas and most comments about the dipmeter also apply to the micro-scanner. Semi-horizontal fractures appear as a short conductive anomaly on all four curves. Examples of these sharp conductive spikes are shown on a 4-pad dipmeter above. Individual spikes represent bedding planes or semi-horizontal fractures. Fracture intensity counts are made by counting the number of spikes per unit length. Modern thought now suggests that there is no such thing as a horizontal fracture; they are considered to be poorly indurated laminations. Regardless of their proper name, they often contribute to well performance and are easily found with the dipmeter. Semi-vertical fractures usually cause a relatively long conductive anomaly on two opposite pads, or on one pad if the fracture is off axis enough to be missed by the opposite pad. 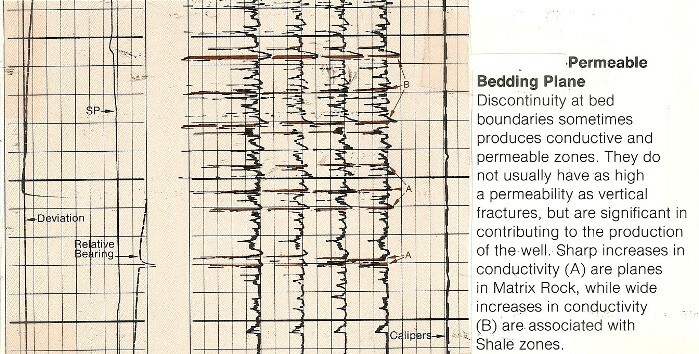 A typical vertical fracture is shown by the shaded portions on the fracture identification log (FIL) presentation shown above. This kind of analysis is normally done on expanded scale playbacks of the raw dipmeter curves. Notice that the grid lines in these examples are two feet apart, displayed at 1:20 or 1:40 depth scales. Total length of vertical fractures compared to total interval is a useful measure of vertical fracture intensity. The fracture anomaly may disappear or jump from one curve to the next as either the fracture or the tool rotates around the borehole. Because of this, repeat passes should be made in zones of scattered fracturing to provide better detection. 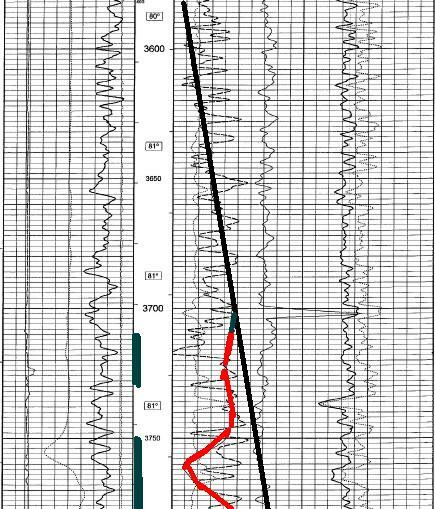 When all four pads show conductive streaks over a long vertical interval as below, right side, a badly broken, rubble zone can be inferred. To amplify the fracture detection capability, the dipmeter curves may have to be rerun or replayed with a different scale to show all non-fractured zones as saturated (ie., displaying a constant maximum resistivity). The log should be recorded in the usual way to get the best dipmeter data. Then with the aid of the computer in the logging truck, the curves can be displayed in different formats to emphasize fractures. On existing logs, this can be done in the computer center if the data tapes can be located. An easy way to analyze fractures with the dipmeter consists of comparing the values of one pad to values of the other pads by replaying adjacent curve pairs on top of each other. The curves are normalized in tight, high resistivity zones. The magnitude of the separation of the curves provides a qualitative indication of the fracture intensity. This visual overlay technique has been dubbed the Fracture Identification Log (FIL) by Schlumberger, where the shaded areas represent vertical fractures. Many other semi-horizontal fractures and permeable bedding planes are also present, and contribute to production. Another example, from the Austin Chalk (above), shows the heavily fractured upper zone, the poorly fractured lower zone, and an intervening zone with no fractures. Notice that the bedding planes in the shales look a lot like fractures, so a preliminary screening to identify shale zones is absolutely necessary. 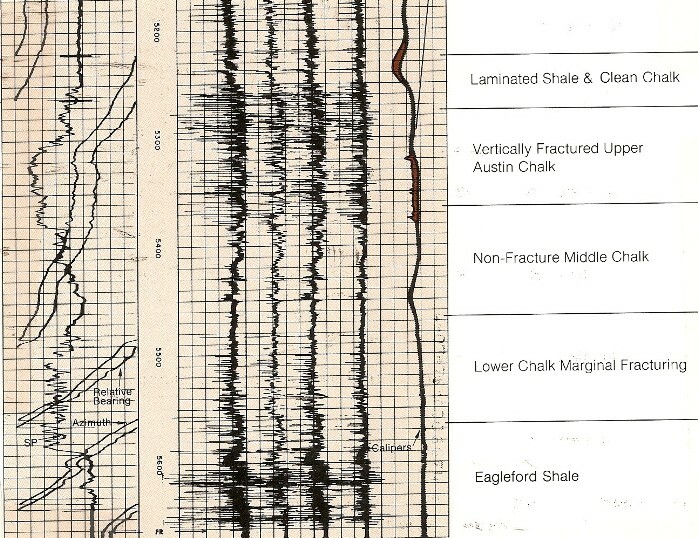 People looking for oil or gas in fractured shale can use this technique to great advantage. The FIL presentation can be made for most types of dipmeters if the data tapes can be located. For older, pre-tape, dipmeters eyeball techniques must be used. The Stratigraphic High Resolution Dipmeter (SHDT), with 8 conductivity curves, is a little more difficult to use than standard high resolution tools. Vertical fractures may influence both electrodes on a single pad. An FIL presentation can be made by turning off one curve from each pad or by presenting two sets of FIL overlays. The GEODIP presentation may show numerous unconnected bed boundaries in fractured zones. SYNDIP will often show non planar dips or no dip correlations at all (bubble coding). Since pad orientation is known from the directional data, the fracture azimuth can be determined. This will indicate the preferential permeability direction. The azimuth of pad 1 is recorded directly on low angle dipmeters, but the magnetic declination must be taken into account. Under normal conditions, it is easy to read AZ1 on the log opposite the fracture, add the magnetic declination, and put the result in the range 0 to 360 degrees, using mental arithmetic. See previous illustration, left side, shows the pad azimuth for a number of fractures showing the preferential direction to be in the range 170 to 200 degrees, or roughly south. Fractures to the north are expected also, but are not as obvious. This may be due to off axis fractures or poor pad pressure in that direction caused by hole deviation or bad tool maintenance. If the density log shows high porosity spikes that are not seen by the neutron log, usually fractures, large vugs, or caverns exist. Broken out borehole also causes the same effect, but fractures are often present when this occurs. Both cases are shown at the left. Because the density tool only looks at a small fraction of the borehole circumference, only a few of the fractures present will be logged. The depth of investigation is rather shallow, so mudcake and borehole rugosity can have an appreciable effect on the total measurement, despite the fact that it is a pad type contact device with some borehole compensation applied. Large density correction values in competent rock, especially when weighted muds are used, is a fracture indicator. The fracture network usually does not increase the total porosity appreciably, but the resultant increase in compensation, due to the rugosity, mudcake, or fluid in the fractures, provides an indication of fracturing. Both density and density correction curves show fractures better if the log is recorded with a short time constant. This makes the log look noisy and possibly useless for its normal purpose. The time constant on existing logs can only be changed by reprocessing raw count rate data from the original data tape. Large PE values, greater than 5.0 cu., especially when weighted muds are used, is a fracture indicator. Barite has a very large photoelectric cross section, 267 as compared with 5.0 for limestone and 3.1 for dolomite. Thus the PE curve should exhibit a very sharp peak in front of a fracture filled with barite loaded mud cake. On the log at the right, two very sharp peaks on the PE curve correspond to fractures. The density correction curve also has a bump for the presence of heavy mud. Corroboration from other sources is essential. In light weight muds, an abnormally low PE value, less than 1.7, indicates, fractures, bad hole condition, or coal. The compensated neutron log looks at the entire circumference of the well bore, but is usually decentralized to minimize borehole effect. It is not a useful fracture indicator by itself. However, neutron porosity values are often compared with other sources to indicate either lithology or the possibility of fractures. The sidewall neutron log sees only a small portion of the borehole wall and may be affected by borehole break out in the same way as the density log. Break out is often associated with fractures. No one would go out of their way to run a density neutron log combination to identify fractures. However, it is the most common log suite run today, and must be used if no other fracture logs have been run. Fortunately the resistivity log, which is nearly always available, can also help identify fractures and this helps confirm density and PE anomalies. The natural gamma ray spectral log provides a quantitative measurement of the three primary sources of natural radioactivity observed in reservoir rocks: potassium, uranium, and thorium. The usual gamma ray log records the sum of these three radioactive sources. This log should not be confused with the (induced) gamma ray spectral log, which is a form of pulsed neutron log run in cased hole to evaluate lithology and water saturation. Most productive formations show a low content of all three radioactive isotopes. The radioactivity associated with potassium and thorium is normally attributed to clays in the formation. Since uranium salts are soluble in both water and oil, zones of high uranium content indicate fluid movement, subsequent mineral deposition, and thus a probable zone of permeability, usually a fractured zone. An Austin Chalk example is given at left. Here the upper section is heavily fractured, the middle is not fractured, and the bottom fractured in a few places. In nearly all cases the uranium curve shows high radioactivity at the same depths as the sonic amplitude and sonic variable density log indicate fractures. In some cases, uranium may be present in the porosity without a fracture, as in the shaded portions of the example. In others, there may be fractures with no uranium. Just as with any fracture location method, there is no absolute guarantee of identifying all fractures. If uranium data is not available, the apparent shale volume from SP, gamma ray, and density neutron crossplot are compared. If the gamma ray derived shale volume is higher than the others, uranium in fractures may be suspected. Sandstones are sometimes radioactive because of clay or feldspars, not fractures. This can be confirmed by sample descriptions. In thinly laminated sand-shale series, the zone will appear radioactive due to the shale, but may also contain uranium in fractures. To locate fractures in these beds using the gamma ray method, calculate shale volume independent of the natural radioactivity, then compare this to the actual radioactivity, some of which may be due to uranium in fractures. If a spectral log is available, the assessment is easier. The natural gamma ray spectral log is one of only three methods that can be used in cased hole to locate fractures. The others are the array sonic and temperature logs, to be described later. CAUTION: In some areas, fractures are never radioactive, so this method is not always suitable. Mud fluid invasion into a fractured zone can lower its temperature. If logged before it can return to the geothermal temperature, the presence of fractures or, at least, invasion can be confirmed. It is possible that the invasion is merely a function of porosity, but usually the effect is smaller than for fractures. Gas evolving into the mud system, often from tight fractured reservoirs, may be seen if the mud system is static and under balanced for sufficient time. The cooling anomaly should disappear above and below the fracture zone, and will disappear everywhere in a few hours if no additional flow or invasion takes place. In perforated cased holes, and in open hole or barefoot completions, an injection profile can be run by increasing pressure on the well head and then logging several passes with a temperature log spaced over a few hours. The pressure will force fluid above the zone downward, injecting cooler fluid into the formation. The larger temperature anomalies are often associated with fractures or the best permeability zones. Temperature log in a naturally fractured gas shale shows low temperature anomaly. Perforated interval is shown in the depth track.